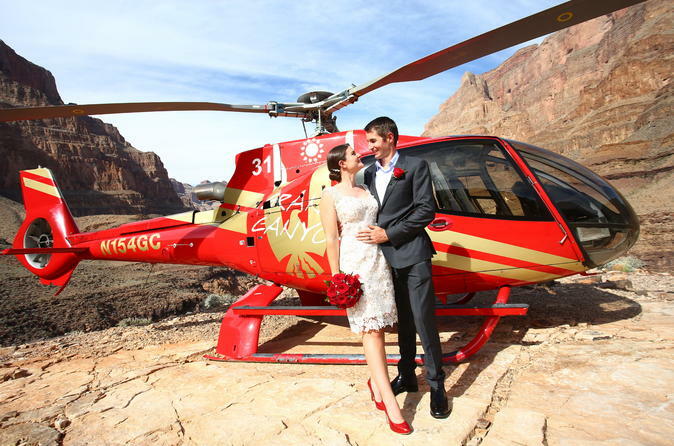 Say “I do” with a view with this Grand Canyon Helicopter Wedding package. Make your way over one America’s most stunning natural wonders in a six-seat helicopter and enjoy the ease and convenience of having all the details and planning done for you. Opt for an Elvis or Johnny Cash impersonator to officiate (additional cost) and make it a true Las Vegas experience! Experience the beauty and wonder of one of America’s greatest natural wonders and say “I do” with a view on this Grand Canyon Helicopter Wedding. Fly from Las Vegas in the comfort and style of a six-seat helicopter and relax knowing all the details are taken care of for you! Travel in a deluxe limousine to your helipad and take off with up to two guests, your minister and a photographer. Soar over Lake Mead and the Hoover Dam, then navigate the red rocks of the Grand Canyon on a stunning flight into its depths. Enjoy epic mountain scenery and a view of the Colorado River as you land on a bluff accessible only by helicopter and exchange your wedding vows in one of the most iconic destinations in America. Opt for a Johnny Cash or Elvis impersonator (extra cost) for a real Las Vegas experience, followed by a champagne picnic and photo session. Travel back to your helipad over famous Las Vegas landmarks like the world-famous Strip and Fremont Street. This popular Sin City package includes a minister who can perform catholic (non-Roman catholic), civil or other religious ceremonies in English or Spanish. The helicopter can seat only six people, including the couple, minister, photographer and two guests. Price quoted is for 6 passengers per helicopter, subject to weights provided (bride and groom and up to 2 guests plus a minister and photographer). Extra seats available with the purchase of an additional helicopter. Prior to your travel date, all passenger weights MUST be advised to the supplier. If you do not indicate this at the time of booking, you will be required to call the supplier and advise them of this information directly. The supplier contact details will be on your voucher once you have a confirmed booking.